Jak and Daxter are heading to the PS4 in new HD bundle! I’m pretty excited about Jak and Daxter on the PS4! Naughty Dog are set to release an updated version of the Jak and Daxter series on the Playstation 4. The games will feature a HD make over bringing the graphics up to today’s standards. I remember the graphics being pretty amazing back in the day! Jak and Daxter: the precursor’s legacy was one of the first games I owned on the Playstation 2. I spent a lot of time trying to convince my friend that it was a brilliant game. He, however considered it to be a child’s game because of the art style and lack of guns. Gotta remember that GTA3 was out around that time so he was more into gritty ‘adult’ games at that time. I loved the humour of the games, which mostly came from Daxter. The first game was a platformer through and through with a very innocent feel to it. The second game in the series is a far more grittier experience. The games now contained guns and the ability to drive vehicles. 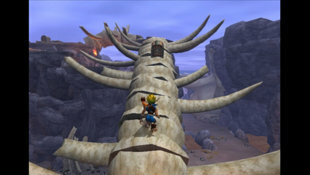 Jak also gained new abilities thanks to ‘Dark eco’. I didn’t get around to playing the third installment and it’s still sat on my shelf waiting for me to get around to playing it. Currently Jak and Daxter: the precursor’s legacy is available on PSN right now. The rest being released on the 6th December. If you didn’t get to check them out in their original formats make sure to download these awesome games for Christmas! For more information go to the Playstation website here. Are there any games that you’d like to see get a HD polish? Or do you think that they need to stop re-releasing old games? Let me know in the comments if you’re excited to play these again?